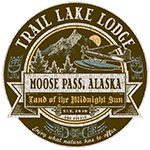 Trail Lake Lodge in serene Moose Pass, Alaska, is near some of the most beautiful bodies of water on the Kenai Peninsula, including Kenai Lake and Crescent Lake. Kenai Lake drains into the world-famous Kenai River, as you might expect, where massive king salmon spawn during much of the summer. 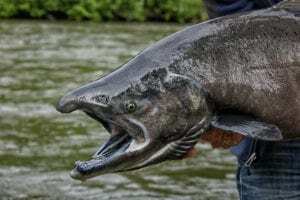 King salmon, also known as chinook, is the largest species in the Pacific salmon genus, thus making them a prized catch. We can guarantee that you won’t be breaking the world record (97 lbs. 4 oz. 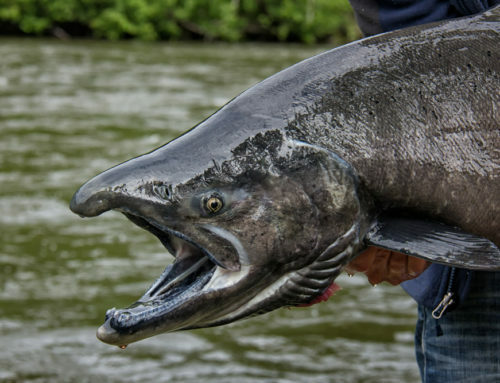 ), which was caught on the Kenai River, but you’ll undoubtedly have the time of your life catching massive, delicious kings during June and July. King salmon will typically arrive in mid-May, depending on the season, and depart at the end of July. 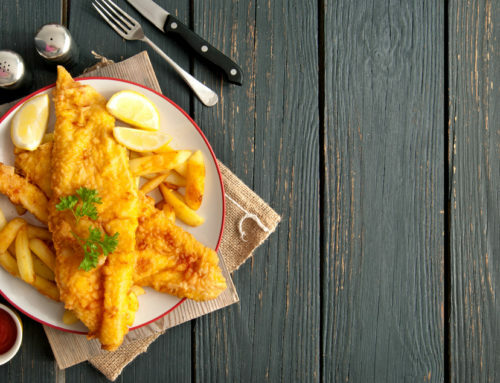 Kings average approximately 37 pounds in the Kenai River, so you’ll certainly have plenty of properly-packaged frozen salmon for the rest of the year. The first sockeyes of the season start to arrive into our beautiful teal rivers in late May with a second wave coming in mid-July. Sockeyes are also known as red salmon because they turn a bright red color during the freshwater spawning phase. While adult sockeye salmon typically range somewhere between 8-12 pounds, they’re a popular foe because they make terrific table fare. Sockeye fillets are not as fatty as chinook, and their texture is thick and buttery. Most visitors don’t arrive with their minds on sockeye salmon fishing in Alaska, but you’ll be hooked once you reel in one of these beauties. The coho season here at Trail Lake Lodge is one of our most popular draws because silver salmon fishing in Alaska takes place during autumn’s peak. 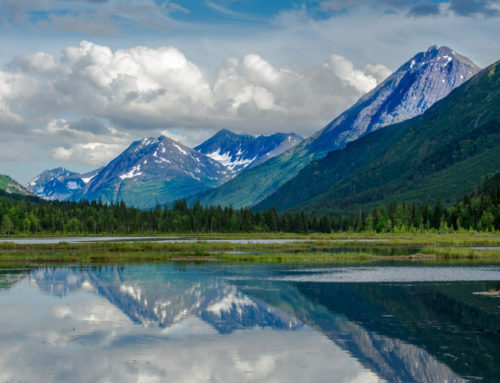 As you can probably imagine, the mountains surrounding the teal waters of the Kenai River begin to turn beautiful shades of yellow and orange, which creates the perfect backdrop for a full week of fishing. Silver salmon, also known as “coho,” arrive in late July with the season ending on November 1. On even years, the silver season coincides with the release of pink salmon. Late July on even years yields four salmon species at the same time, thus making it the busiest week of the year here in Moose Pass, Alaska. Remember to purchase an Alaska fishing license before your arrival, folks. 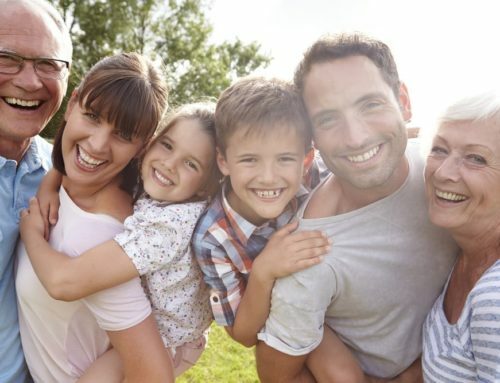 While you’re certainly more than welcome to choose a week-long fishing package, we also provide over a dozen adventure activities for those who want to experience everything that Alaska has to offer. 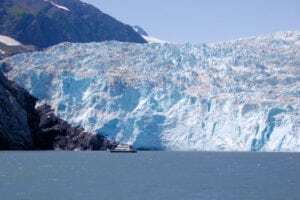 You can explore some of the best hiking trails in Alaska, visit nearby Kenai Fjords National Park, and dog sled on Godwin Glacier. As a reminder, we’re now accepting applications for Alaska summer jobs. 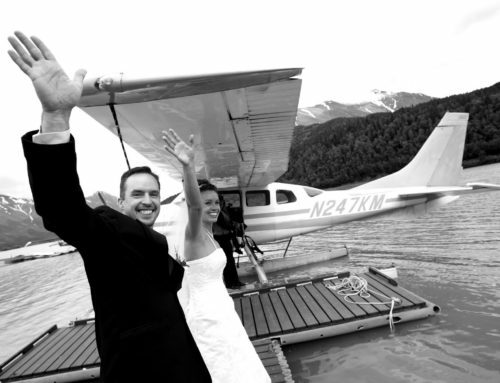 Alaska fishing adventures start at Trail Lake Lodge, so call us today at 1-907-288-3101 to book a once-in-a-lifetime getaway to the Kenai Peninsula!